Vicky Harvey works for and trained with HTC Plant Ltd, the crane company employed by Kier, and she is one of only a handful of female crane drivers in the UK. 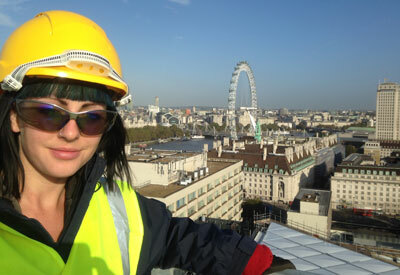 She studied for three months at a specialist college in Norfolk before qualifying with a Level 2 NVQ in plant operation. 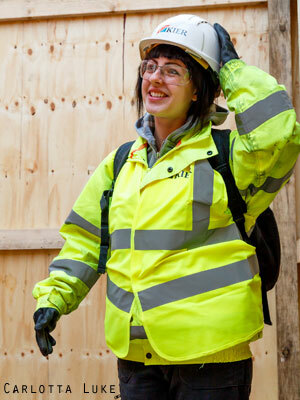 Vicky has recently started work on Kier’s UTC@harbourside (university technical college) site in Newhaven, Sussex. Before coming into this last summer I was a marketing manager. For a good few years I’d been trying to get into marketing and graphic design. That was where I came from before this. Following a few job redundancies, marketing and advertising being the first budget to go due to the recent recession, I struggled to continually get work in that sector. Having lost my last job in marketing, I decided that things needed to change drastically. 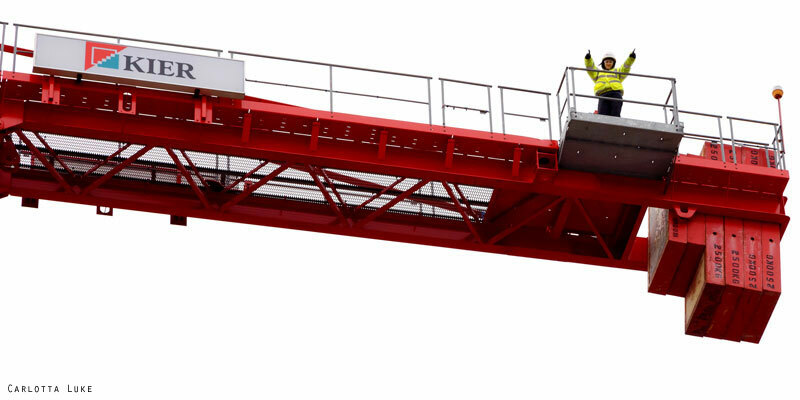 That’s when a friend of mine who was also a site manager for Kier said, “Why don’t you look into becoming a crane driver?” I laughed, as you would, and thought, “Yeah. Right!” He opened my eyes to the prospects of it. Then having applied to HTC, which is the crane company I work for, I had an interview and I was then offered a placement at Bircham Newton Construction College in Norfolk, where I trained for three months last year before going to work on site. I’ve been on other sites before this one since I left college in October, mostly in London. On the UTC@harbourside site there are no other women. It’s just me, but it’s not a very big site here. The building that we’re working on is a protected building, right next to the river. We’re reconstructing the insides of it to create a campus to teach 14 to 18-year-olds across Sussex about marine engineering and environmental technology. There are 50, maybe 80 people here, whereas most construction sites are quite a lot larger than that. It’s irrelevant really [that I’m the only woman on the site] because I spend all my time up in the crane, so I don’t interact with the people on the ground other than on the radio or I may pop into the office regarding paperwork or things like that. Otherwise I’m not really that interactive with the rest of the team, other than to specifically do my job. It’s a great conversation starter when I say what I do, as you can imagine, down the pub. They’re usually quite shocked. They say, “Oh, really? !” And then I may have to prove it by showing a few pictures. It’s a very interesting topic because it’s not an expected career for a woman. I think there are three of us in the country at the moment and that’s about it. I know there’s one who’s in the London area currently. I’m it as far as I know, in this area at least. I get a certain amount of satisfaction from learning particular points of a site that you go back to. It sounds really odd, but if you do a ‘good’ lift and you aim to be on target, like target practice would be normally, you land it and it’s right and the chains are bang on the target that you’re aiming for, then I find that really rewarding. It doesn’t always happen and you’re always given direction by your signaler on the ground, but if you get into the right area before they start giving you directions, it’s always a bit of a bonus because you’re making their lives easier and it makes you look good! 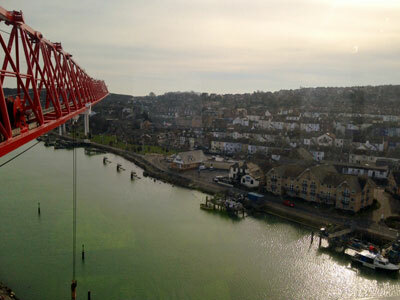 On this particular site, I’ve discovered how very, very friendly local people are, because I’m currently the only crane in Newhaven at the moment and obviously the only female operated one. It’s been absolutely amazing here because I’d put a couple of photos from at the top of the crane of the view over Newhaven town on the Newhaven Facebook page, and hundreds and hundreds of people ‘liked’ it. I’ve been inundated with lots of people saying, “We watch out for you climbing the crane every day! We walk past after school on the school run and we always wave!” It’s been an absolute humbling experience because people have really got on board. They’ve been excited for me. 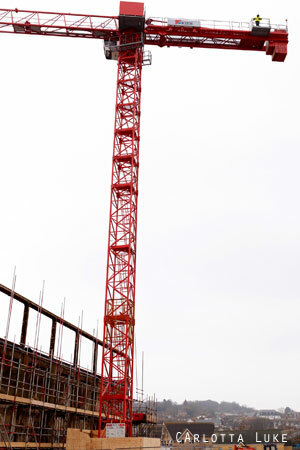 A mother even said to me that her little boy – who’s about five years old and has got ADHD so he struggles with his schooling – was really excited about the crane and the building site as he passed on his way back from school. So I said, “If you guys want to come over to the site, my site supervisor will let you have a slightly closer look from the pedestrianised route.” So she came over and they spent a good couple of hours just watching what was going on. Apparently he loved it and she wrote a letter of thanks, and that was all over Facebook and we’ve been in the local Argus paper. It’s been so lovely. I would probably reiterate that all the jobs that you think are not possible as far as construction is concerned on the less physical side, like operating plant machinery, they are possible. They’re very, very achievable. You just need to know that is an opportunity that exists. When it was first suggested to me to become a crane operator, I said, “Nah! Really?” It didn’t even occur to me that it would have been a feasible option and unfortunately it’s not widely advertised. I’d like to improve my skill as time goes on and hopefully get more local sites to work with. Kier have been brilliant. They’ve been really supportive of the fact that I’ve come into this site still on a ‘red card’, where you’re still training and improving your skills. I’m not with anybody while I’m operating the crane, but I’m still relatively new to it. They identified that and they support me. Not all companies would be as supportive, so I’m grateful to them for that and also the companies that I’ve worked for so far. I’m looking to continue to improve and eventually gain my ‘blue card’, which means that I’ll be a recognised competent operator, having done my time.